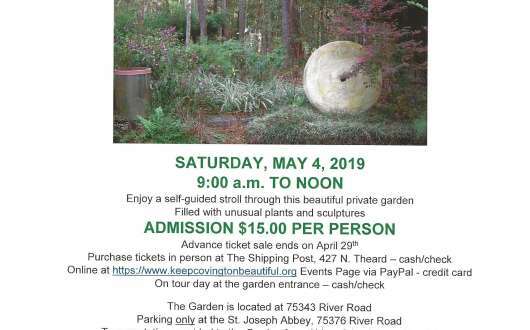 Keep Covington Beautiful presents the Hopewell Garden Tour on Saturday, May 4, 2019, 9 am to 12 pm. Enjoy a self-guided tour through the beautiful private garden filled with unusual plants, planted similarly to English gardens, mixing structure with undulating, free-flow planting. Some plants to be found in the garden include Davidia involucrata (Dove tree), Cryptomeria Black Dragon, numerous grasses. several gingers plus many other perennial plants purchased over the years from arboretums and nurseries in Baton Rouge, Franklinton, Folsom, Covington and Forest Hill, Louisiana. 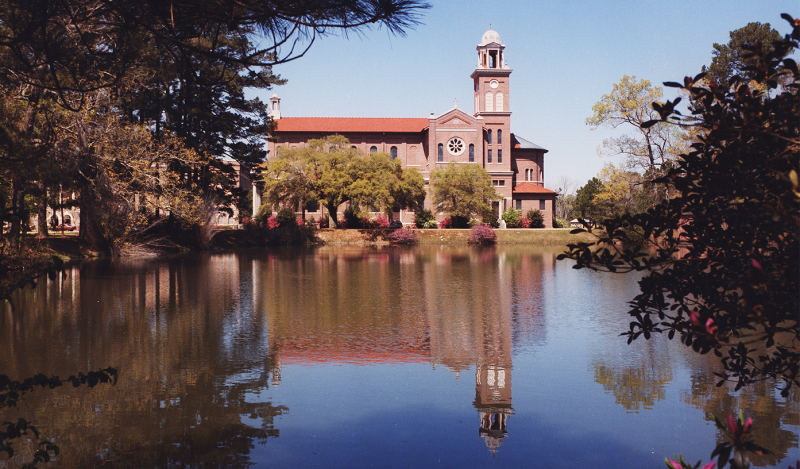 The garden also has two small ponds and sculptures by Mark Grote, retired professor at Loyola Univ. and co-owner of the garden. Admission is $15 per person. 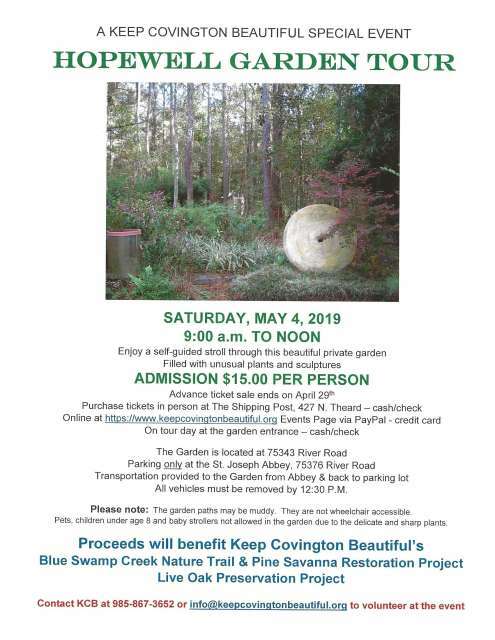 Proceeds benefit Keep Covington Beautiful's Blue Swamp Creek Nature Trail & Pine Savanna Restoration Project and its Live Oak Preservation Project. Pets and children under age 8 not admitted, as the garden is full of delicate and sharp plants. The garden is not accessible by wheelchair. Paths are often muddy, so be sure to wear appropriate footwear. Purchase tickets in advance until April 29 at The Shipping Post, 427 N. Theard St, Covington. The garden is located at 75343 River Road in St. Benedict, LA 70435. 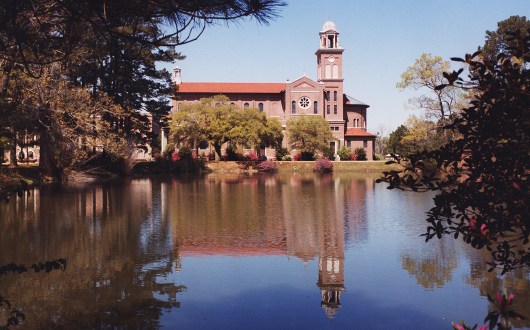 Parking is across the road at Saint Joseph Abbey at 75376 River Road; transportation provided to and from the garden. Vehicles must be removed from the Abbey by 12:30 pm. Additional Garden Information available at http://hopewellgardenllc.com.